The way to your pet's heart is through its stomach... Which food should I choose? Most people are now aware that what we eat directly affects our health. A good nutrition contributes to good health and helps to prevent illness. This also applies to our pets, a fact that is not quite as widely acknowledged. Appropriate, high-quality food can prevent many problems for our pets, and may have a positive effect on their appearance. Cats and dogs are carnivores (they eat meat). However, dogs could also be described as omnivores (they eat everything). In nature, wolves and wild dogs hunt herbivores. Because they eat the whole animal, including the gastrointestinal tract, they ingest a lot of vegetable material as well as meat. The dog's body is well-adjusted to this: they have relatively long intestines for carnivores, and their teeth can tear as well as chew. A proper nutrition that you could provide your dog with is IAMS Dog Food. IAMS provides high quality dog food and their diets are rich in nutrients and vitamins your loyal companion needs. Do you prefer fish-based dog food? Then have a quick look at Fish4Dogs. Cats need more high-quality animal protein. They mostly get this from muscle tissue. In contrast to dogs, organ meat does not form part of their natural diet. Their teeth and gastrointestinal tract are adapted to this carnivorous feeding style. This is why you cannot just give your cat dog food without consequences, as their nutritional requirements are too different. If you do this, it may create a deficiency of certain nutrients. It may also lead to gastrointestinal problems such as diarrhoea. Which food should I choose? Some people choose to prepare their own dog or cat food. If you do this, it is important that you ensure that all of the essential nutrients are included in the correct amounts and proportions. It is easier to give your pet so-called commercial food. Commercial pet food (food bought in bags or cans) are complete, balanced foods. This means that they contain all of the nutrients that the animal needs, which ensures that your pet will get all of the required nutrients. A good example of a complete and balanced diet is Royal Canin dog food. There are many pet food brands on the market, which differ greatly in quality. This can usually be seen based on price: better quality food is generally more expensive than lesser quality food. This is because better raw materials are used and because more research has been carried out into the correct composition and proportions of nutrients in the food. They are often also more easily digestible. This means that more of the food can be absorbed by the body and fewer undigested substances are excreted by the body. In other words, the pet produces less waste. What's more, the pet does not need to consume as much of the food on a daily basis whilst still getting all of the required nutrients. The food will therefore last longer. As mentioned before, our pets' nutritional requirements vary. They vary for different animals, breeds, ages, sizes and even individually. For example, a Great Dane puppy has completely different needs to your average senior cat. Of course, the food should taste good too. But what one dog finds delicious, another may hate. After all, tastes differ. So it can take a bit of trial and error to find a suitable food for your dog or cat. If you want to switch to a new food, it is important that you do so gradually. Abrupt transitions to new food can lead to gastrointestinal problems. The best approach is to mix the old food with the new food for a week, gradually reducing the amount of old food and increasing the amount of new food with each meal, until you have phased out the old food entirely. Don't switch foods too often. Animals don't need anywhere near the variety that people do, so it shouldn't be necessary. 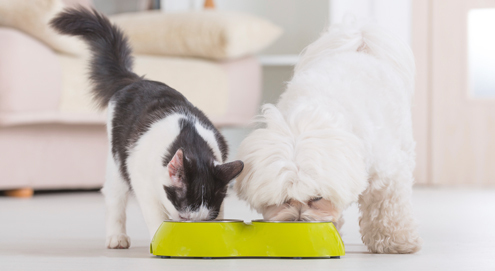 Whether you give your pet wet food or dry food is a question of personal preference. There's an argument for both. Of course it doesn't need to be an either/or situation. You can also choose to combine the two. In the production of dry food, nearly all of the water is removed. The advantage of this is that this increases the shelf life once the packaging is open compared to wet food. It is often said that it is better to give pets dry food instead of wet food, because it prevents dental plaque. Although the chewing does mean that the teeth are cleaned mechanically, sticky dry food residue can get stuck between the teeth and actually cause dental plaque. There is special dry food available that prevents dental problems. This food prevents the formation of plaque and tartar thanks to the size, shape, structure and ingredients. The great advantage of wet food is that dogs and cats often find it more palatable than dry food. One of the reasons for this is the stronger smell, which stimulates their appetite. Another advantage is the amount of water in wet food. This is especially useful for animals whose water intake needs to be stimulated, such as dogs and cats with bladder or kidney problems. Thanks to the wet food, they consume more water without having to drink more. For healthy animals that are not predisposed to any health problems, standard, high-quality maintenance food is suitable. This food will contain all of the nutrients that your dog or cat needs to stay fit and healthy. Within the maintenance food range, there are many options in terms of quality, flavour and price. There is something for every animal. Rising in popularity and appreciated for its high quality standards is Farm Food. This brand offers a premium range of diet food for dogs for every size and age. Farm Food's kibble is pressed dog food with all its important ingredients well preserved. Due to this production method, no additives such as preservatives, colourings or flavourings have to be added. We are becoming more and more aware of our environment. As a result, we are increasingly choosing sustainable and organic products. Organic food is also available for our dogs and cats. This food will have an "organic", "eco" or "bio" hallmark. This hallmark is legally protected and indicates that the product only uses meat from animals that are reared in accordance with the organic requirements, that it does not contain any added chemicals and that no genetically modified ingredients have been used. Yarrah Cat Food is a great example of 100% organic dry food, wet food and treats for cats. Do you want to choose a diet specific to your pet's needs? Then you can choose a wellness food for your dog or cat. Various brands offer dog and cat food specially developed for pets that need a little extra care. For example, there are foods for every age category, and foods for neutered or spayed pets. Special foods have also been developed for small and large dog breeds. The nutrients in these foods have been adjusted to ensure that they meet your pet's needs. For certain conditions, food can play an essential role as part of treating the condition. This is the case for urinary crystals, a common problem in cats, which can effectively be controlled through the use of the right diet. For dogs or cats with renal insufficiency, a kidney diet can lead to a major clinical improvement, and may even prolong the animal's life. Sometimes, a diet food can even serve as a complete treatment of a disease. Hyperthyroidism (an overactive thyroid) in cats, for example, can be treated in some cases using a specific food that is low in iodine. This may result in medication becoming redundant. Because diet food can be seen as medication, this can only be used when prescribed by a veterinarian. Dog treats can be a useful tool in raising and training your dog. Try to choose responsible treats with healthy ingredients. You should also take into account any conditions that your dog suffers from when choosing the treats. For example, if your dog has a food allergy, you should choose a reward that will not cause an allergic reaction. Although cats are not as easily trained with treats, they do like a tasty snack every now and then. Take care to limit the number of treats given. Cat treats must really be a special reward and should never replace the cat's normal food! Rabbit food should consist mainly of roughage (hay). This provides them with fibre, which keeps the gastrointestinal tract active. In addition, the chewing ensures the natural wear of the teeth, keeping them at the right length. Fresh hay should be available at all times and can be eaten in unlimited amounts. If the rabbit does not eat enough hay, the intestines may stop functioning and this can cause a lot of problems. A small amount of concentrated food can be given as an addition to the roughage. Mixed grains are often given, but this is not recommended. Rabbits will only eat the tastiest parts (such as the fatty nuts and seeds) and leave the rest. The main nutrients are in the pellets. If they are left each time, your rabbit will have nutrient deficiencies. Giving compressed, high-quality pellets, such as Supreme Science Selective is a better idea. Do not give too much of this concentrated food; approximately 20 grams per kg of body weight per day will suffice. If your rabbit eats too much of this, it will eat less roughage. What's more, the food is high in energy and may cause your rabbit to become overweight. You may also give your rabbit some fresh vegetables daily, but please note that not all vegetables are suitable for rabbits! Vegetables should also be given in moderation in order to prevent intestinal problems. Fruit can only be given in very small amounts, because the sugars lead to gas in the intestines. Fruit also results in the rabbit becoming overweight, and may cause diarrhoea. For rodents compressed pellets are also better than mixed food. For guinea pigs, added Vitamin C is essential in food. In contrast to other pets, guinea pigs cannot produce Vitamin C in their own bodies and must therefore absorb it through food. Rabbit food is therefore unsuitable for guinea pigs. For dogs with food hypersensitivity (rabbit & rice). For adult medium and large breed dogs. Complete, pressed food with mutton for dogs. 100% organic food for adult dogs with chicken. Rich in salmon and available in two chunk sizes. Organic maintenance diet for healthy adult dogs. Maintenance food for adult cats aged 1 to 6. For adult and ageing dogs. With a high protein content for growing puppies.